Click on any picture to enlarge it, or any movie still to play the movie. Eight toobers lying on the floor. Shoe is shown for size comparison. 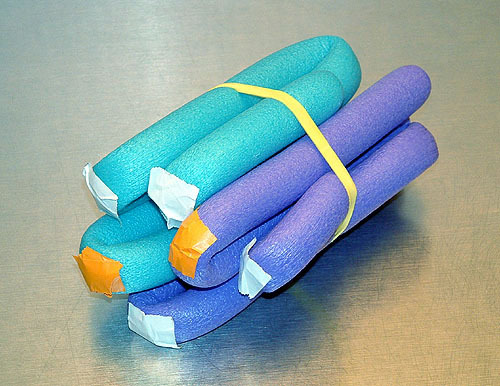 "Toobers" are soft, flexible, inexpensive foam plastic rods about a meter long, and as big around as a good-sized carrot. They are easily bent and hold their shape, due to an aluminum wire running down the center. 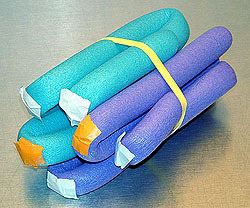 They were originally available as a component of toys named Toobers and Zots® by Hands-On Toys. 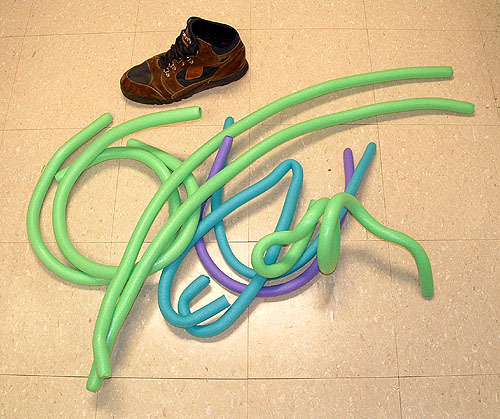 I first learned about toobers from Tim Herman and Michael Patrick in their SEPA Workshops for high-school teachers where students used them in a nifty Protein Folding Challenge. Toobers are quite useful in helping to convey certain structural concepts in science lectures. My experience is with protein structure, particularly in immunology, but I'm sure they can be adapted to other concepts as well. Toobers can also be used by teams of students for hands-on discovery. An inexpensive kit with instructions for a protein folding challenge is available from 3DMolecularDesigns.Com. who also offer more ideas for toobers. Caveat: the movie clips here intentionally oversimplify some concepts for the sake of brevity. Yes, I know that my "DNA" doesn't have major and minor grooves (adding them would be easy enough), that immunoglobulin domains have more than a few beta strands, and that there are no disulfide bonds holding VH to VL. Discontinuous vs. continuous epitopes of protein antigens. 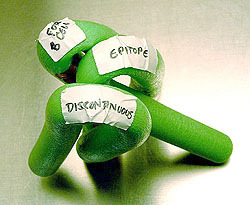 The end of the green antigen domain shown above was marked with three pieces of white tape, to represent the epitope recognized by the antibody. 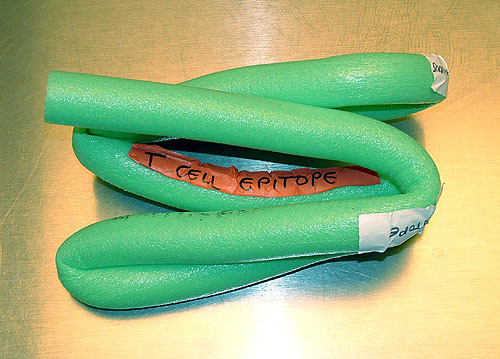 Unfolding and refolding this clarifies the concept of a discontinuous epitope. Fig. 2 shows the "end" of the antigen model, while Fig. 3 shows the "side" of the same model. In Fig. 2 is visible a strip of red tape representing a typical continuous epitope that could be presented by MHC and recognized by a T lymphocyte. 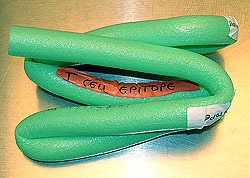 The continuous epitope is a linear sequence of amino acids. Unlike the discontinuous epitope recognizable by antibody (but not by a T lymphocyte), the continuous epitope is not dependent upon conformation (native vs. denatured). 1 min 55 sec, 5.4 megabytes. This variable fragment (Fv) is half of the antigen-binding fragment (Fab) produced by papain digestion of antibody. 3 min 20 sec, 9.5 megabytes. Detailed physical models of macromolecules, also excellent for teaching, are available from 3DMolecularDesigns.Com (Tim Herman, Milwaukee School of Engineering, Wisconson USA). Molecular Sculpture and other physical models of macromolecules, including Byron's Bender, at History of Visualization of Biological Macromolecules. Free software for rotating 3D models of proteins, DNA, RNA includes the user-friendly Protein Explorer (proteinexplorer.org) accompanied by a well-illustrated Atlas of Macromolecules. It includes Lesson Plans. Interactive, animated tutorials on molecular structure of DNA, Hemoglobin, Antibody, Lipid Bilayers and Channels, etc. are available at Eric Martz's Chime Resources Site. A large number of ready-to-use tutorials on structures of diverse macromolecules is available through the World Index of Molecular Visualization Resources, molvisindex.org. Some are in Spanish, German, etc. Please send suggestions for additional links to emartz@microbio.umass.edu.